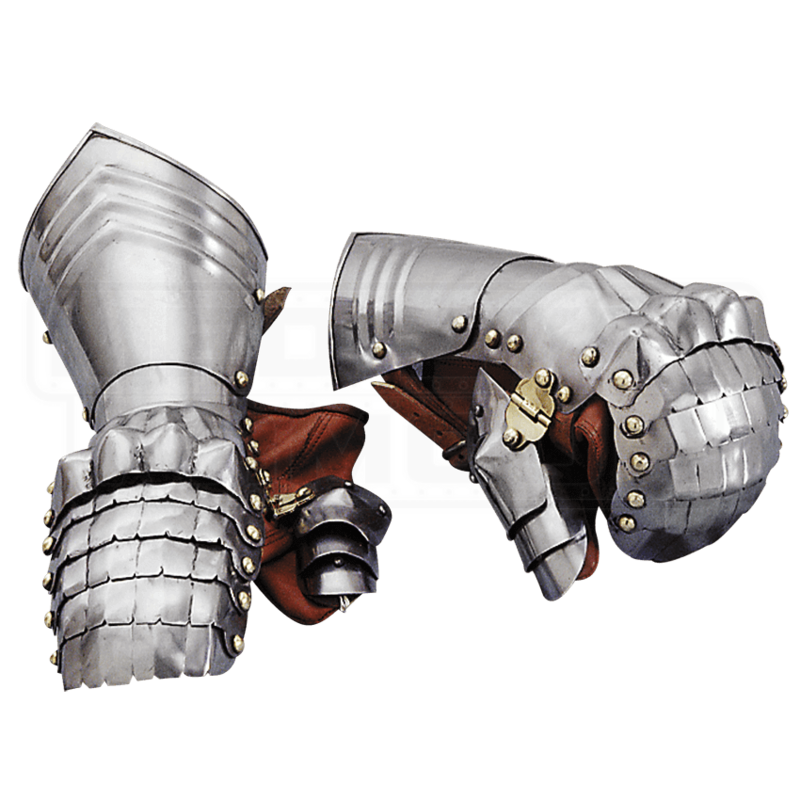 The hand is particularly vulnerable in close-quarters combat, and so the medieval gauntlet became a particularly important piece of armor. Medieval Mitton Gauntlets, like these, were of use to warriors who were less concerned with individual finger movement and were more concerned with keeping their hands fully protected on the field of battle. These gauntlets are simple in construction, consisting of a series of 18 gauge steel plates, all fitted together to create articulation, which allows the hand to move with ease. They consist of a cuff that wraps around the wrist, as well as an under-glove, which makes wearing the gauntlets comfortable and easy. The biggest difference between these mitton gauntlets and others is that were other gauntlets have individual fingers, these gauntlets have singular plates along the fingers, creating a mitten-like effect over the fingers. These gauntlets are available in one size and come as a matched pair. If you are really expecting your fingers to come under attack, then the solid plating of these Medieval Mitton Gauntlets is a great way to foil any strike that is directed at your hands, while ensuring that you keep your weapon firmly grasped and ready to go.